Everlast Services is proud of every job we do. We thought we would highlight this particular project because it involves so much of what we’ve staked our reputation on – first class fencing, perfect concreting and attention to detail in our landscaping efforts. Take a look at the time lapse video below to see Everlast in action. Whenever you’re working around water, safety must come first. One of the first things the Everlast team did was erect safety fencing around the pool. This ensured our employees could work in safety by keeping power tools and other dangerous items separate from the water. It also protected the client’s pool. 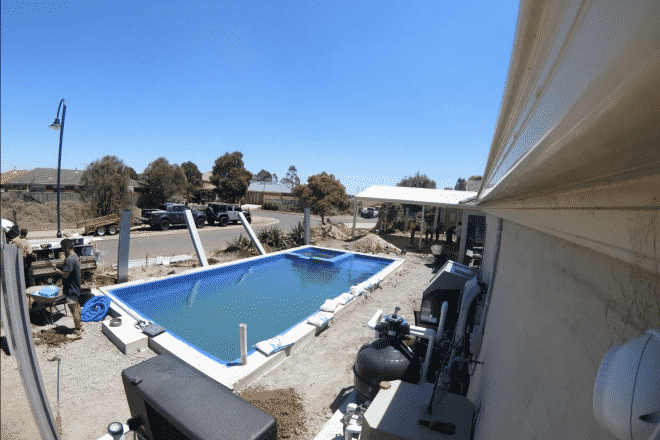 The fencing meant that nothing could be dropped or spilt into the water, so the clients didn’t have to worry about emptying and refilling their pool once the project was finished. Modular fencing is one of our favourite products. As you can see, it can be erected exceptionally quickly. Just set up the posts and attach each frame and you’ve got a stylish and functional fence. The owners will be able to enjoy their fence for years with no repainting or maintenance required. They can just hose it down, and it will look good as new for decades. It also has the benefit of acting as a soundproofing device. They won’t hear any noise from the street, and they can enjoy the pool well into the wee hours without disturbing anyone. With modular fencing, you really do get an oasis in your backyard. This video does prove just how talented our team of concreters is. The team pays attention to creating a perfectly level surface, while the use of reo bars allows for a strong and even pour. The focus on quality means Everlast can assure the clients that they will be able to enjoy this space for years to come. What pool surrounds would be complete without a decking? Every slat was chosen for its hues and colours, before being cut and boxed to perfection. The final result is a deeply-coloured decking that contrasts beautifully with the blue of the pool, while also creating a levelled backyard that completely opens up the space. The perfectly poured concrete forms the foundation for perhaps the most crucial elements of the landscaping – the travertine pavers. We source the best pavers form our suppliers, and each paver is chosen for its perfection. Resistant to discolouration (vital around a pool) and easy to clean because they don’t hold on to debris. No scrubbing and rubbing, just a hose and a sweep and you’ll be looking at sparkling pavers. If you own a pool, you have to be responsible. The modular walls take care of the fencing requirements, but a lockable gate is also required under Australian and Victorian law. This beautiful powder coated steel option is perfect for their needs. It satisfied all regulatory requirements thanks to the lock, but the slatted design still allows plenty of sunlight in. It is also incredibly hardy and will only need a hose down to remove any dust and grime. The same powder coated slats were also used to protect and hide the pool equipment and machinery. That means only the best parts of the pool are shown, and all the mechanisms are hidden. This is important for the overall aesthetic, while also ensuring that none of the equipment is damaged by the various shenanigans that go on around a family pool. Thanks to expert design and the choice of cost-effective yet beautiful materials, Everlast Services were able to provide this homeowner with a pool landscaping service that was comprehensive yet affordable and luxurious yet liveable. The client couldn’t have been happier with our team’s approach to their job and their commitment to quality at every turn. We are incredibly proud of their work, and this project is one that will inspire us for years to come.